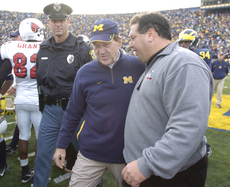 Posted on Fri, Mar 2, 2012 : 9:40 a.m.
Lloyd Carr (center) and Brady Hoke at a U-M football game. By: Mark Wilhelm: Eat Dinner with Coach Carr, Coach Hoke, Dhani Jones, and Mike Martin! Have you ever wanted to eat dinner with a Michigan football legend? Here is your chance. By: Caroline Rankin: Urgent Message: Please stop desecrating Mary Beth Doyle Park and forest! I live... near Mary Beth Doyle Park. I have frequented the park and woods that surround it ever since I was a child... This is why it is so upsetting for me to see evidence of disrespect and destruction against a place that offers itself as a refuge from the outside world. By: Full Circle Community Center: Laughter IS the CURE! Sat, Mar 3, 2012 : 12:57 a.m.
T. Wall 2nd Page. In this time of tight budgets, and the limited assets that the city has available, it is time for people to put some personal effort into keeping our parks beautiful. As founder of the T. Wall Foundation, I have learned that people who have some personal involvement , by volunteering, have a sense of pride and satisfaction in their contributions that far exceeds anything that a check can provide. Sat, Mar 3, 2012 : 11:10 p.m. Sorry - pushed wrong button ... As for &quot;volunteering in order to graduate&quot; - I am deeply against it. Let the &quot;for credit&quot; biology, ecology, etc. students take on some of these tasks for extra credit if they and the teachers wish. But either make it an official part of one or more school days, or skip the labor draft of our school kids. Sat, Mar 3, 2012 : 11:07 p.m. Sat, Mar 3, 2012 : 12:54 a.m. I was born, and raised, in Ann Arbor and I always loved playing in our parks as a child. Today our parks are not maintained due to budget cuts. Unfortunately, the only maintenance done is cutting the grass when it becomes unsightly. Our park rangers have been eliminated. It's almost impossible to catch the individuals who disrespect our parks and forests. Being a special education teacher for 30 years, I have come to realize that great changes come from educating our children. Both times I ran for Mayor I proposed a program called Hands On Ann Arbor. There are over 17,000 children in the Ann Arbor School System. Unfortunately, many of them do not have to do Community Service to graduate. The City could develop a Special Parks Committee where the Ann Arbor school children would be responsible to help maintain the beauty of the parks and woods close to their schools. This would be part of the Ann Arbor schools curriculum. For example, our Kindergarten children could plant flowers in the park. In the summer, they would go for a walk in the park with their parents to maintain their flowers. Also, the child would be taught to inspect the park to make sure no one had vandalized the park. There is a lot of work to be done in organizing this program by volunteers. I imagine the second graders could build a rock garden. The 3rd and 4th graders might be responsible to lay down woodchips on the paths. Most of the flowers, rocks and woodchips would be donated. In time, all the children would learn to love and take pride in their parks. Our Neighborhood Park Watch would encourage both parents and children to enjoy our parks and woods and take pride in their stewardship.